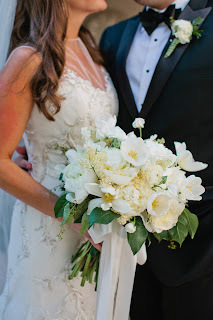 Another of my bridal bouquet portraits recently completed. This one was commissioned by a husband in Nashville as a first anniversary gift for his wife. 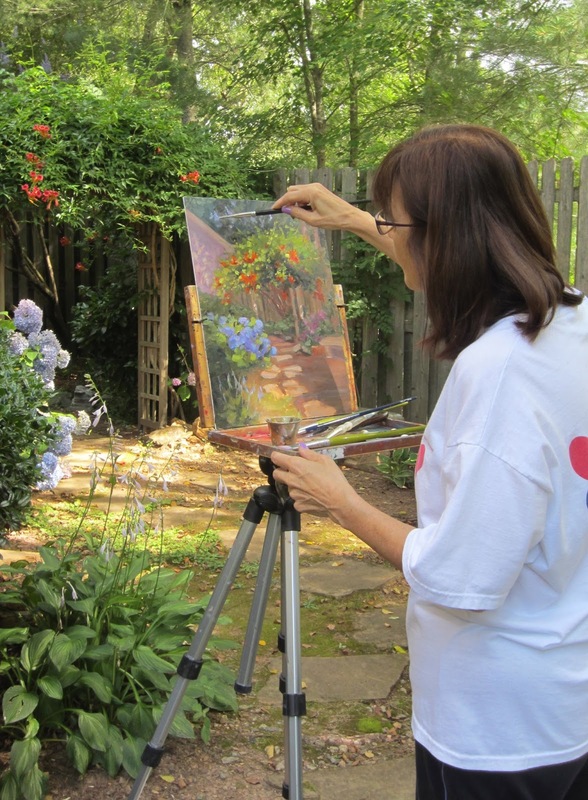 If you'd like a bouquet for a wedding or anniversary gift or have some other special flower or scene you'd like to have created on canvas, please contact me. 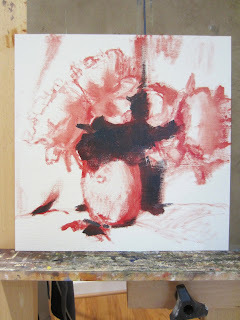 I love to paint white flowers. They can include so many other subtle colors. 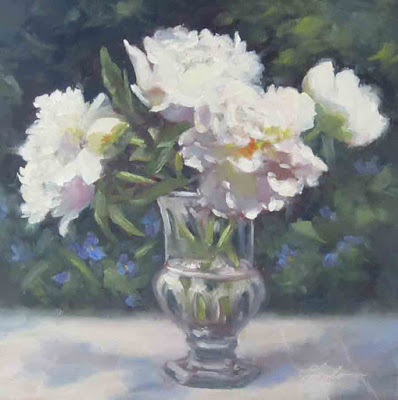 Here are some white peonies out in the sunlight. 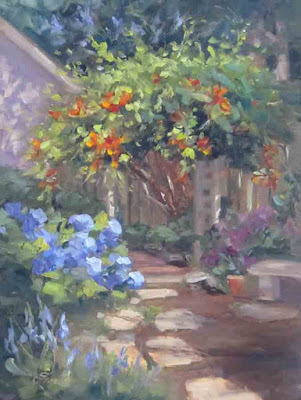 I fell in love with trumpet vines when I first saw them in Tuscany. So when we came home my husband installed this arbor in our garden and we started to grow the vines over it. 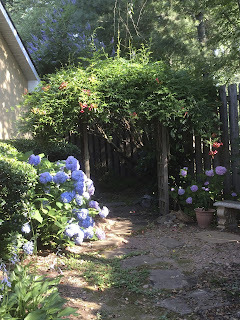 This year they have finally come in fully and I love to see the sun on the trumpet vine and nearby blue/lavender hydrangeas in the morning. Today I actually took my plein air easel and went outside to paint in my yard, which I now call "My Happy Place". 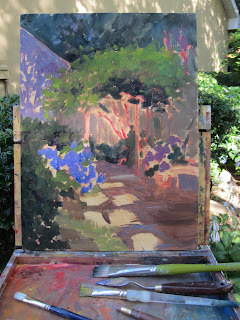 Here are some scenes from the garden and the work in progress. 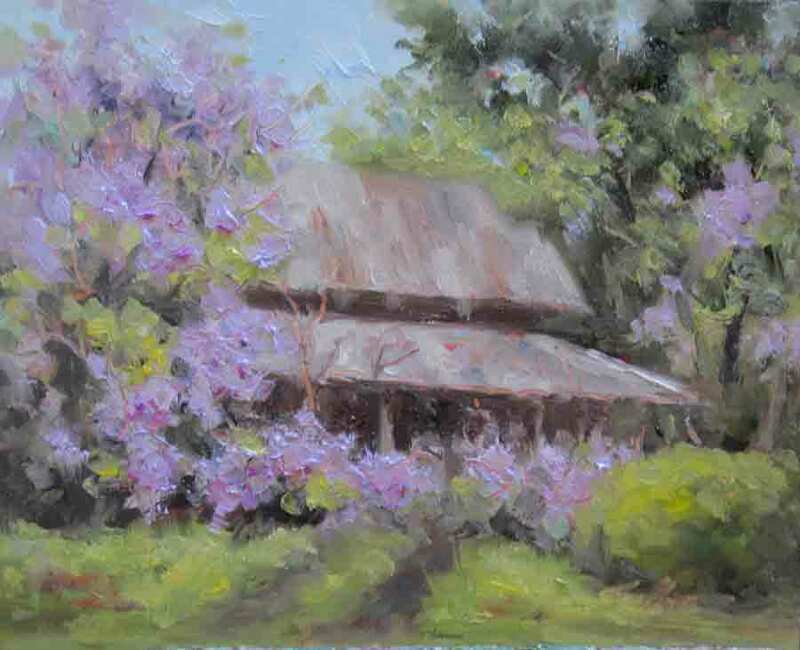 I grew up in New York City so don't have many memories of barns growing up, so they are not necessarily a subject that resonates with me on an emotional level, but when one is covered in purple wisteria, I couldn't resist. Saw this scene while up in North GA a couple of months back but wasn't in a position to paint it there, but took some photo's to remember it by. It looked like an old abandoned barn, overrun by wisteria vines. 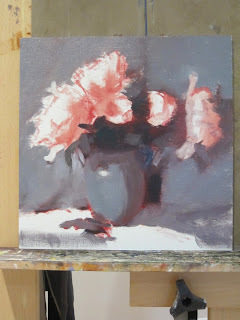 Painting some peonies this week as I am participating in a short on-line course by the wonderful artist Dennis Perrin. 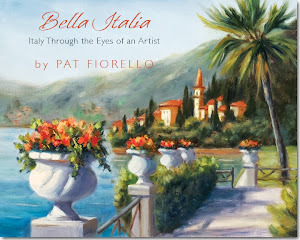 The course is focused on this specific type of flower, which is both beautiful and challenging. 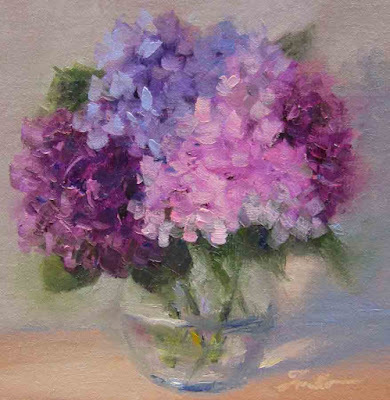 I teach painting flowers in both watercolor and oils and sometimes my students are surprised that I still take classes after 20+ years of painting, but I believe as an artist, as well as for most important commitments in your life, you have to continually be open to learning, growing, expanding, otherwise things can go stale and the passion can diminish. Learning and growing keeps you challenged and energized, even though sometimes you have to pass thru stages of frustration, seemingly forgetting things you thought you knew. I enjoy seeing Dennis's approach which is quite different from my other typical methods of painting flowers (usually start with a loose transparent base, no drawing, then build form with opaques on top, or another approach I often use is to block in darks and lift out lights) . His approach starts with a loose drawing, blocking in general values shapes, (working darkest to lightest) and then coming back to refine those value shapes into smaller shapes/ nuances of color, temperature, staying within the values. 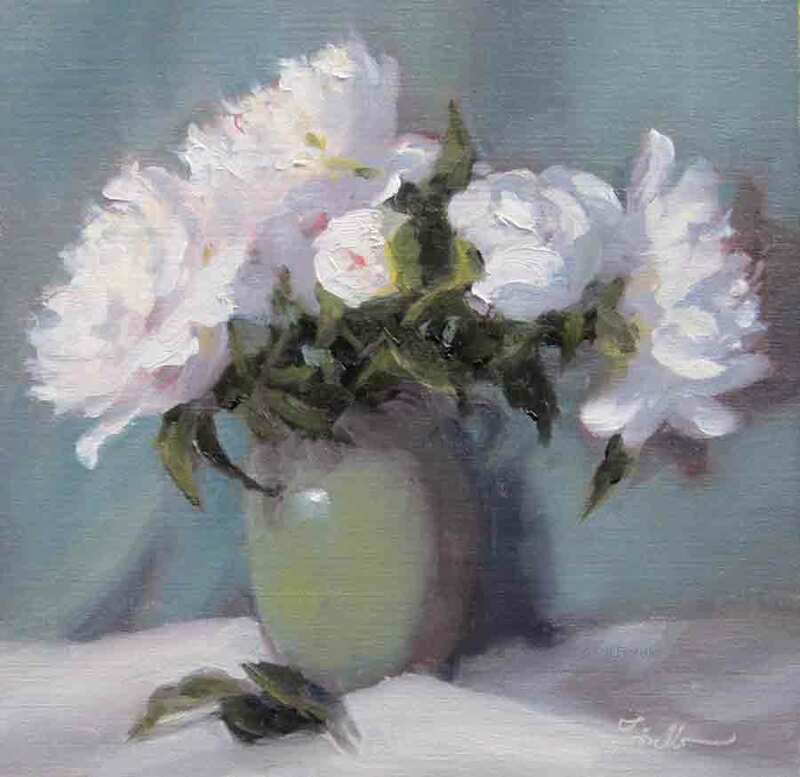 Below is the photo I used for reference (was not able to get fresh peonies in Atlanta with the limited time I have here this week). This was one I took last year from fresh flowers I arranged in my studio. I changed some things to make it more of a square format and changed the background color to a cooler neutral. I decided to focus on one thing as a growth challenge for myself when doing this painting. In other words, deliberately choosing a growth goal to explore beyond my comfort zone. I decided to let go of my useful color preferences and only work with the limited palette that Dennis uses as an experiment to see how it would be to move off the color options I am comfortable with ( I prefer the "unlimited" palette- usually have out about 15 or 20 colors). I think the palette worked well for the white flowers. Not sure if I'd be as happy with it for multi-colored flowers, but that is something to explore too. 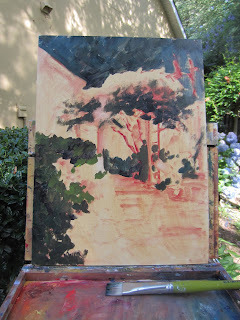 Below are photo's showing how the painting unfolded from initial drawing to finish. A few weeks back I'd painted some coastline scenes from my trip to Costa Brava in Spain. That inspired me to revisit my photo's from the California Coast from a trip I took few years back. Very similar rocks and shoreline. Hydrangeas picked from my garden were the inspiration for this study.